Sorry everybody, my A5 Filofax failed terminally. 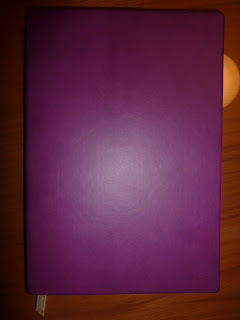 I really do have to be able to carry my planner around with me everywhere, and the A5 Filo binder is just too big. And my Minister weekly planner wasn't doing it for me because now I don't have many scheduled events (so I don't need the timed daily columns) but I do have loads of tasks (so I need more space each week for lists). 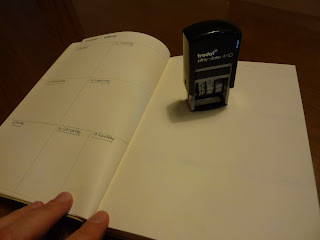 I'm pining for my Uncalendar Half-Size planner, which would be perfect in this situation. It has month-on-two-pages grid calendars, week on one page with the opposite page for lists, and loads of notes pages. 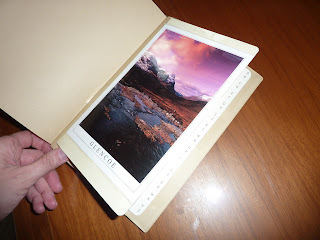 Click here to see my review of it with lots of photos of the interior pages. But since my Uncalendar is on a boat somewhere with the rest of my household shipment, I had to create my own version. Perfect excuse to buy a new notebook! 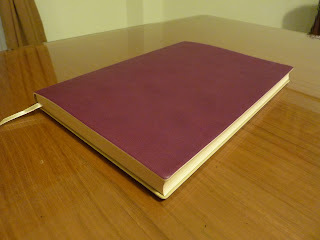 I bought a Daycraft Signature Sketchbook in the large (A5) size. You may remember my review of the small size sketchbook (which you can click here to see). I bought the sketchbook here in Jakarta at Aksara bookstore in Kemang. (@Aksara_Store on Twitter). 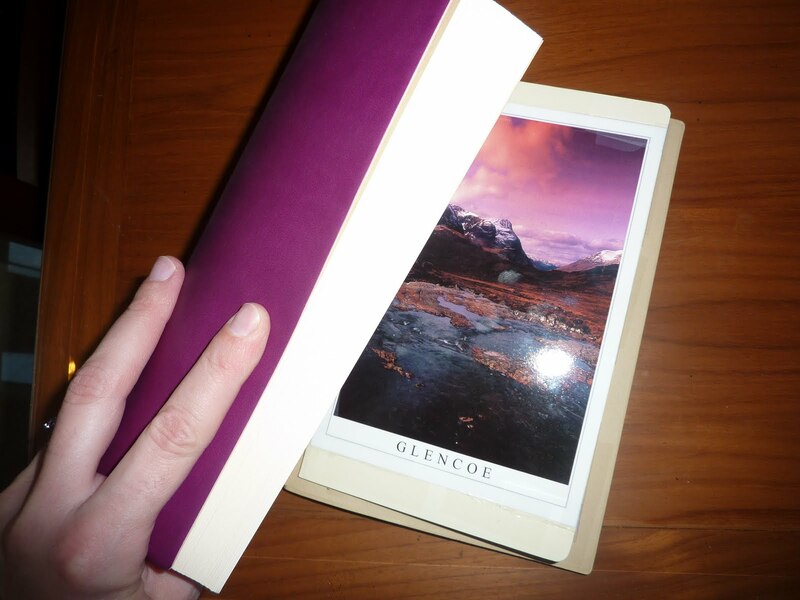 The paper is cream colored, and the page edges contrast nicely with the purple cover. 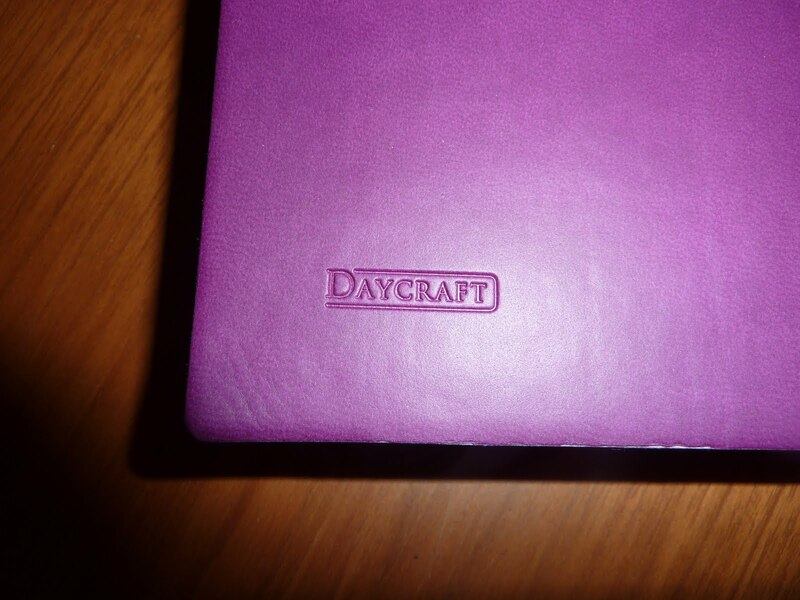 The cover is smooth with Daycraft embossed on the back. As far as I know, Daycraft is still looking for distributors in the US and Europe. If you don't have a Daycraft retailer near you, you an order them from Australia on the Vera Chan website (http://www.verachan.com/online-shop/) with worldwide shipping. 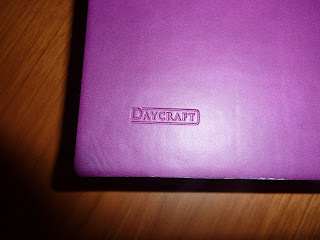 You can find Daycraft notebooks here: http://www.verachan.com/online-shop/stationary/ and the Signature notebooks are listed as "Classic notebook." She has generously offered Plannerisms readers 20% off all products when you enter the discount code plannerisms at checkout! I actually put the month calendars in front, and the weeks behind. I only did until July because that's when my Extra Large Moleskine 18 month weekly notebook starts, and I plan to switch to that planner when it starts (on June 27th to be exact). So this planner is really just a stopgap until then. 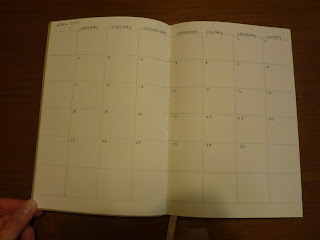 But, if I get to July and want to stay with this planner, there are enough pages in the book that I can draw up monthly and weekly pages all the way through the end of the 2011-2012 school year. The day spaces measure only about 40 sq. cm, which are not large enough for me when I'm busy. 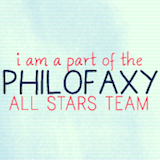 (From experience I know I need day spaces of 65 sq cm or larger when I'm busy.) But I think these day spaces should work fine for me until July because I'm not very busy. The Extra Large Mole weekly notebook day spaces are about 72.5 sq cm, so when school starts up along with after-school activities and all that I'll have the big day spaces to handle it all. The Signature sketchbook doesn't have a pocket in the back, so I taped in my address booklet that I removed from one of my large size Moleskine planners. I taped my favorite post card of Glen Coe to the front of the address booklet. The colors on the postcard happen to look really good with the purple cover! So there's my very simple stopgap planner in my new beautiful Daycraft Signature sketchbook to get me through the next couple of months until my Moleskine weekly notebook starts. Interestingly, this is the third year in a row I've been chomping at the bit to start a Moleskine 18 month weekly notebook in July! The first year I also made my own planner to get me through until my Mole started (which you can read about in my 13 Planners post, scroll down to #s 7 and 8). 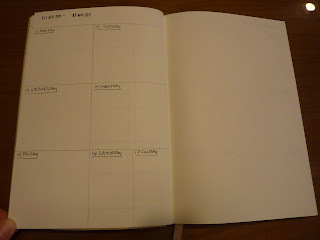 Last year I was impatient to start my new 18 month Moleskine because it had the new monthly calendar grids, so I went back to my old Mole weekly notebook (which you can read about in my 2010 Planners Tally post, scroll down to #5). If I'm being really honest, I think you'll love the 18 month Extra-large weekly Moleskine for about a month (or two) and then hanker after your filofax; switch back to that, then realise the personal is the right size to carry and the wrong size to write enough detail in. 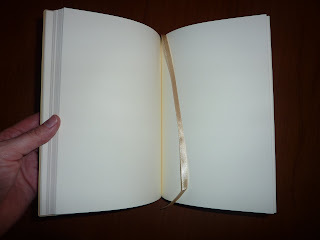 Feeling disloyal to filofax, you'll try the A5 again, only to realise that it's too big to carry about and will go back to the Moleskine. I do love reading your posts. If you did finally settle on the Moleskine, you'd have to find something else to blog about! I love how neat the monthly layout looks! And the combination of postcard and the cover is lovely. I hope it works out well for you, although it would be a pity for us. Are you settling in well? Amanda, that's about the pattern I've followed for the past 2 1/2 years now! I'm hoping to break out of it. Thanks girlinmaths! We are starting to get things figured out a little bit. It's a big adjustment!